IModeShapeObject The IModeShapeObject class defines a ModeShape business object. 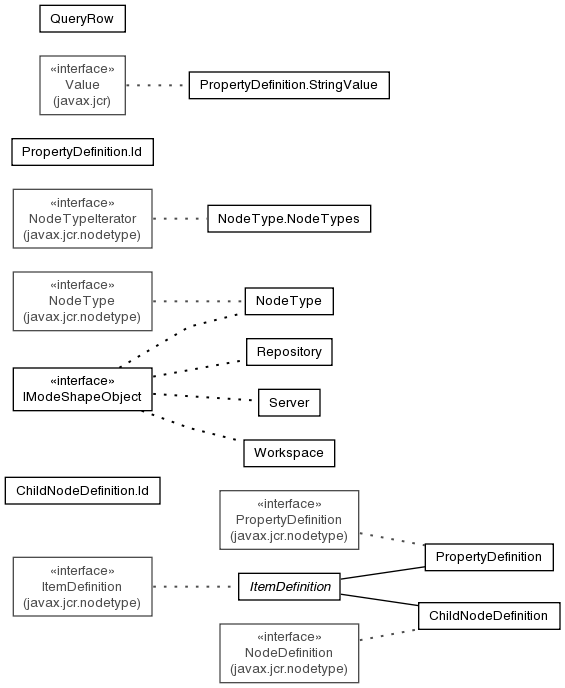 ChildNodeDefinition An immutable representation of a JCR PropertyDefinition. ItemDefinition An immutable representation of an abstract JCR ItemDefinition. NodeType The NodeType class is the business object for a ModeShape supported node type. PropertyDefinition An immutable representation of a JCR PropertyDefinition. Repository The Repository class is the business object for a ModeShape repository. Server The Server class is the business object for a server that is hosting one or more ModeShape repositories. Workspace The Workspace class is the business object for a ModeShape repository workspace. The ModeShape REST Client domain package defines the ModeShape and JCR business objects. These include objects for servers, repositories, and workspaces.